A game can have either two or three strats. For example, the game may contain a Strat A, a Strat B and a Strat C together. The lower or lowest strat must have at least 5 pairs (2 ½ tables) in order to pay overall awards. Limitations of each strat should be established prior to the game. If the game consists of less than the minimum 5 pairs required in the lowest strat you must increase the level of the strat to the next highest legal strat that includes at least 5 pairs. There must be approximately the same number of pairs that sit N/S and E/W in each stratum, so that the section awards will be equal. Strats are intermingled and play against each other in an open game. When the scoring is completed, there are multiple rankings and any pair in a lower strat has the potential to win the greater awards of an upper strat if they legitimately rank there. 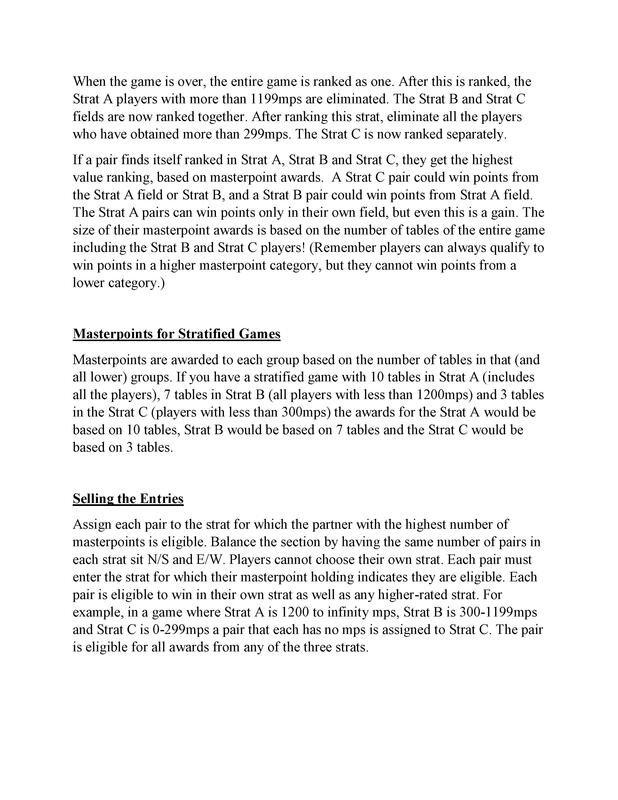 A stratified game is advantageous to all strats: 1) Strat A players get ranked on the number of tables in the entire field resulting in additional masterpoints; 2) Strat B players have the advantage of possibly winning points in the highest strat, based on a greater number of tables which yields more masterpoints; 3) Strat C are ranked against other Strat C pairs giving them the experience against more skilled players without diminishing their chances of winning. Also Strat C players have the advantage of possibly winning points in the two higher strats, which yields more masterpoints. Here is an example. You want your game to have three strats, with C players having 0-299 mps, Strat B having 300-1199 mps and Strat A players 1200mps-infinity. Entries sold to Strat C players are marked C to identify that strat with less than 300mps. Entries are sold to Strat B players marked B to indicate that one person has 300 mps but not more than 1199mps. Entries are sold to Strat A players are marked with an A to indicate more than 1199mps. A pair must enter the strat for which the partner with the highest number of masterpoints is eligible. Pairs from each strat are distributed throughout the section(s) as evenly as possible. When the game is over, the entire game is ranked as one. After this is ranked, the Strat A players with more than 1199mps are eliminated. The Strat B and Strat C fields are now ranked together. After ranking this strat, eliminate all the players who have obtained more than 299mps. The Strat C is now ranked separately. Masterpoints are awarded to each group based on the number of tables in that (and all lower) groups. 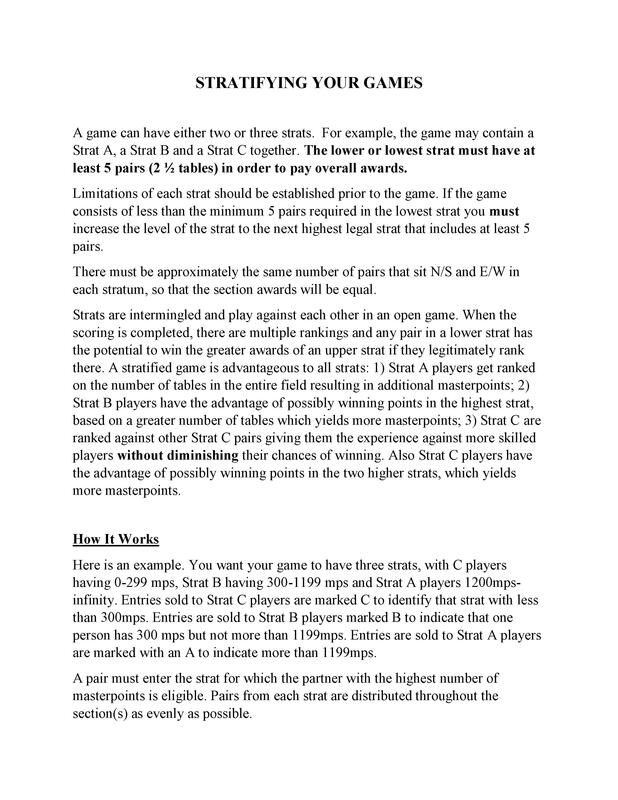 If you have a stratified game with 10 tables in Strat A (includes all the players), 7 tables in Strat B (all players with less than 1200mps) and 3 tables in the Strat C (players with less than 300mps) the awards for the Strat A would be based on 10 tables, Strat B would be based on 7 tables and the Strat C would be based on 3 tables. Assign each pair to the strat for which the partner with the highest number of masterpoints is eligible. Balance the section by having the same number of pairs in each strat sit N/S and E/W. Players cannot choose their own strat. Each pair must enter the strat for which their masterpoint holding indicates they are eligible. Each pair is eligible to win in their own strat as well as any higher-rated strat. For example, in a game where Strat A is 1200 to infinity mps, Strat B is 300-1199mps and Strat C is 0-299mps a pair that each has no mps is assigned to Strat C. The pair is eligible for all awards from any of the three strats.